The Clark Library welcomes class visits from local educational institutions. While the majority of these visits are college and university seminars visiting for a single class period, we welcome a diverse range of students and arrangements, including primary and secondary schools, large lecture formats, community college classes, and UCLA Extension programs. All class visits must be arranged at least two weeks in advance. Please notify us at least 72 hours in advance of rare materials that need to be paged for a given class session. Please contact Head of Research Services Philip Palmer for more details and to book a classroom. 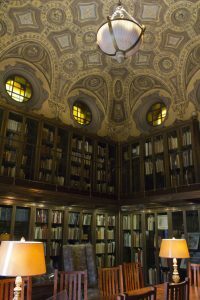 A limited number of courses may meet at the Clark Library for the duration of the quarter or semester, with preference given to UCLA Ahmanson Undergraduate Seminars and other UCLA classes. If you are interested in holding a course at the Clark for an entire quarter or semester, please contact us as soon as possible. Such an arrangement is well suited for classes on book history, bibliography, graphic design, or other topics that will make extensive use of the collections. The Clark can make one of three rooms available for a class visit, depending on class size and staff availability. Standard A/V (Powerpoint, internet) and a document camera are available in any room. These rooms served as the Library’s original collection storage spaces, with bookshelves made of bronze, a copper alloy, in homage to Clark’s copper mining heritage. With atmospheric lighting and seventeenth-century portraiture, the North and South bookrooms are the most frequently-used classrooms for Clark visits. 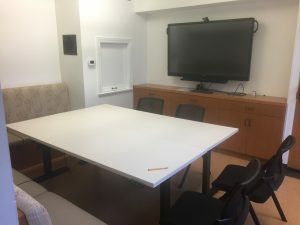 The newly refurbished smart classroom is outfitted with a large touch-screen monitor, Apple TV, iPad, Document Camera, and dedicated wifi network. A great resource for collaboration and digital humanities projects. 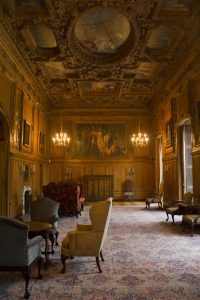 While frequently used as an event space, the Clark Library’s drawing room, also known as “Mr. Clark’s Music Room,” may be used to accommodate larger class visits, including large lectures. In special circumstances, Clark staff may be able to provide rare materials instruction on campus. Please contact Head of Research Services Philip Palmer for more information. Please see our Hours and Directions page for information on getting to the Clark. Ample free parking is available. Some support for bus services is available for large lecture visits; please contact Head of Research Services Philip Palmer for information. As a special collections library, we take the security and preservation of our collection seriously. Food and drink are prohibited in the Library. Visitors will be asked to place bags and coats in lockers or other designated locations before viewing rare materials. Pencils (but not pens), cell phones, notebooks, and laptop computers are permitted. Flashless photography is allowed. In consultation with staff, students may handle collection materials on display. Library staff will provide instruction on proper and safe handling but ask that each student be responsible for washing their hands prior to sessions with collection materials.